About one-quarter of all Palm Cockatoo (Probosciger aterrimus) nest trees have been removed in Iron Range National Park, Cape York. Progress and outcomes: Beginning in 1999 WPT has supported Steve Murphy's Ph.D research and conservation for the Palm Cockatoo through the last decade, funding monitoring and tracking, observing nest sites, studying breeding habits and conducting surveys. Significant findings were that the Palm Cockatoo is a highly specialized feeder that has a low breeding frequency. WPT also began The Palm Cockatoo Fund, in mid-2001, to collect monies to further conservation and research of the species. Focus of future work: Currently WPT is supporting the work of the Palm Cockatoo Project being led by Christina Zdenek, partly funding important conservation-related research which includes a photo identification study begun in 2010. Wild population: Unknown and declining, but subspecies macgillivrayi is believed to have a stable population of about 3000 individuals. Where found: P.a. aterrimus: Misool, in W Papuan Islands and Aru Islands, Indonesia. P.a. macgillivrayi: S New Guinea between Fly and Balim Rivers, and Cape York Peninsula, N Queensland, Australia, south on east coast to Princess Charlotte Bay and on west coast to Edward River. P.a. goliath: W Papuan Islands, except Misool, Indonesia, and C New Guinea from Vogelkop, Irian Jaya, east to SE Papua New Guinea. P.a. stenolophus: Japen Island in Geelvink Bay, Irian Jaya, and N New Guinea from Mamberamo River east to Collingwood Bay, SE Papua New Guinea. History: The Palm Cockatoo (Probosciger aterrimus) is found in Australia and New Guinea. In Australia, subspecies macgillivrayi is restricted to the northern Cape York Peninsula and in New Guinea, it is widespread, mostly in the lowlands and foothills but occasionally ranging up to 1,350 m. However, the population is suspected to be in decline due to ongoing habitat degradation and destruction, and unsustainable levels of trapping. Between 1999 and 2005, roughly 26% of all Palm Cockatoo nest trees were taken out of circulation in Iron Range National Park, Cape York. The main cause was fire, caused by people. Ecology: The Palm Cockatoo is found in New Guinea and adjacent islands, and N Australia (Queensland) in lowland areas, rainforest, forest edge, monsoon woodland, and tall secondary growth, at elevations up to 1350m (4428 ft). It is seen in pairs and small groups, and is conspicuous in its behaviour. 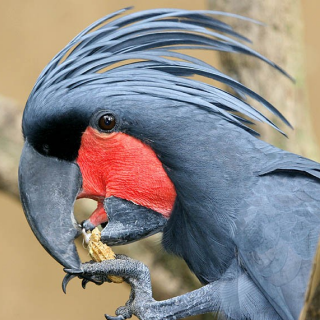 Birds forage for seeds, nuts, fruits, berries and leaf buds.